What is the meaning of equity and why is it crucial in framing the work we do with opportunity youth? The Forum for Community Solutions defines equity as just and fair inclusion in a society in which all can participate, prosper and reach their full potential. Since 2012, the Forum for Community Solutions’ Opportunity Youth Forum has worked with cross-sector, cross-system collaborative initiatives across the U.S. that are focused on building and deepening the education and employment opportunities for opportunity youth, who are 16- to 24-year-olds out of work and school. 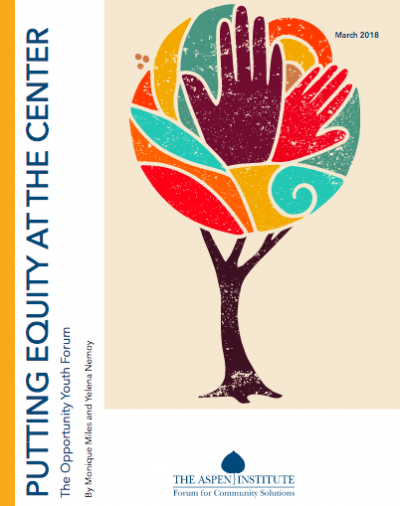 Our report, Putting Equity at the Center: The Opportunity Youth Forum, emphasizes the role that equity plays in these efforts.